In the article titled Fever Coat we discussed in detail the unusual coat condition where there is a lightening or graying of the hair color as a result of a kitten's exposure to a virus, illness of some form, medication or stress. 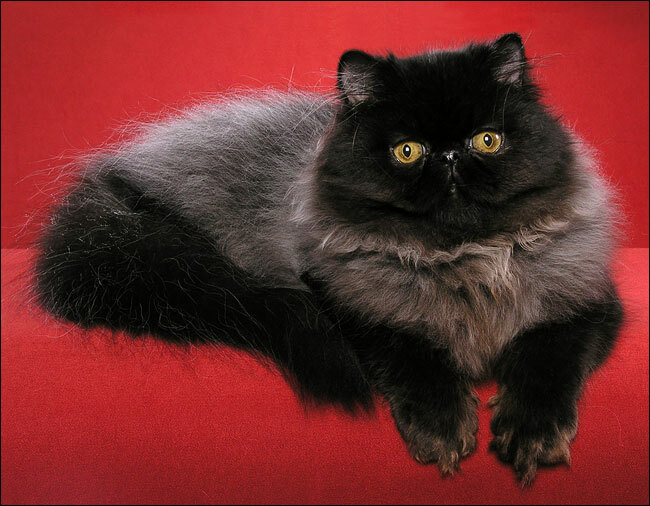 In this article we will look at the pictorial history of a black Persian kitten that was born with a severe case of fever coat. 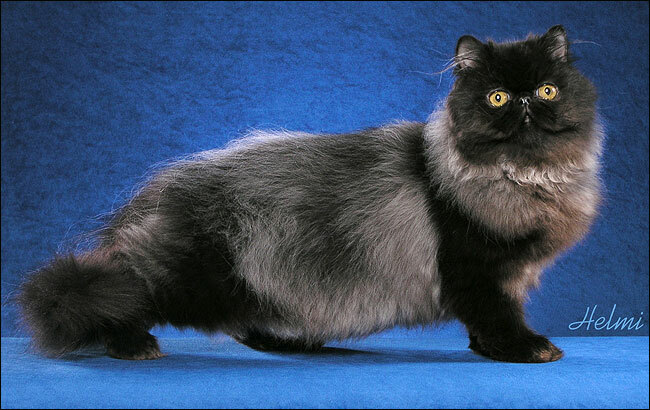 In 2003, Tracy Bayarena of Rare Earth Persians bred Joleigh's Morpheua, a black Persian male to Joleigh Pop Goes the Weasel, a brown tabby girl. On August 5th, the queen gave birth to three kittens — two black males and one brown tabby male. All three kittens were born with extreme fever coat . 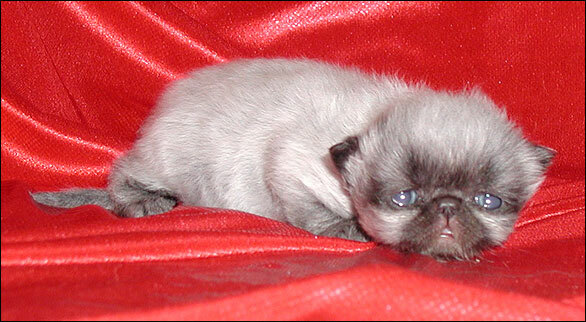 The photos below are of one black kitten, named Zorro, at two weeks of age, shortly after his eyes had opened. Although he is a black kitten, at two weeks his coat appears almost white except for his black ears, and dark gray patches on his face and feet. 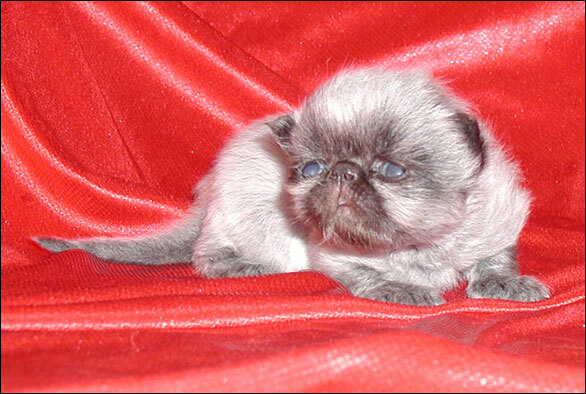 He almost looked like a seal point Himalayan, which was a genetic impossibility. By the time Zorro was two months old, his body coat was a fuzzy silver halo. His legs, face and tail were more obviously black now. In general, while the short hair on his face and legs were black, the longer guard hairs were all a pale silvery color. As Zorro continued to mature, his coat was slowly losing some of the light gray hair and his adult coat was coming in black. By ten months of age, his head. legs, shoulders and tail were fully black while the long hair on his ruff, belly and back was still light in color. 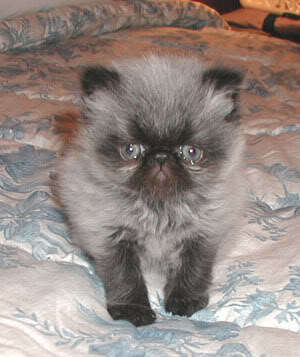 By the time Zorro was an adult, he had shed all the fever coat of his kittenhood and looked like a normal black Persian. Zorro went on to sire wonderful kittens including his phenomenal regional winning daughters GC, BW, RW Rare Earth's Beetle Juice, a Tortoiseshell Smoke and GC, RW Rare Earth Symphony-of-Destruction, a Blue Cream Smoke. It took over a year for Zorro's fever coat to disappear completely and for him to finally sport the inky coat color of an adult black Persian. His two siblings went through similar transformations.